An exceptional symbol of Roman architecture and engineering, the Colosseum was the largest amphitheater (round or oval theater) of the Roman Empire. 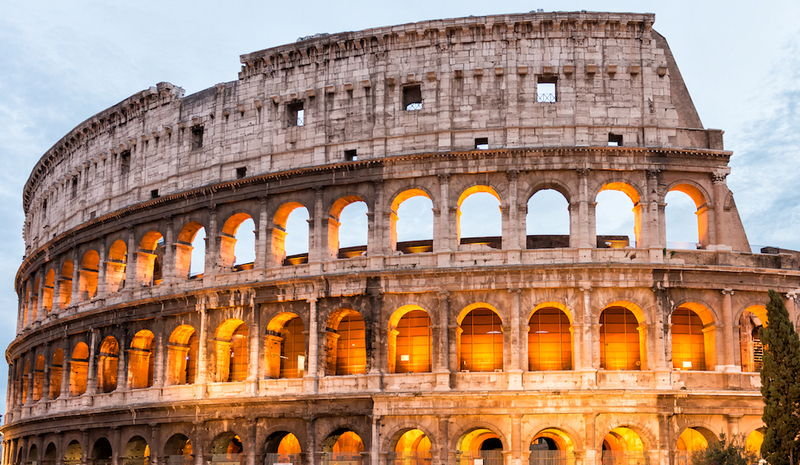 Built between 72 and 80 A.D., the Colosseum has been standing for nearly 2,000 years. Low was high: Designed with a seating capacity of 50,000, the Colosseum was used for, among other things, sporting events and gladiator games. Seating was based on the hierarchy of Roman society –– the lower a person sat in the Colosseum, the higher their position in society. Senators sat at the bottom level of the Colosseum, closest to where the action was happening. Women, the poorest men and slaves could only sit on the top level. Stone + concrete: Made of stone and concrete, the Colosseum was constructed using the manpower of tens of thousands of slaves. Pottery passes: Tickets were made of pottery and people entered the Colosseum through one of 80 entrances. Below the Colosseum were numerous rooms and underground passages, where the animals and gladiators were kept. After the fall: After the fall of Rome, the Colosseum fell into disrepair with both lightning and earthquakes causing extensive damage –– like the collapse of one side of the structure. More damaging however, was the continuous theft of stone and marble from the Colosseum to use on other construction sites in Rome. Wonder: The Colosseum was named one of The New Seven Wonders of the World. Nearly 2,000 years later and it’s still spectacular.